Short-billed Dowitcher Breeding Adult: Large sandpiper, upperparts mottled gray, black, brown and red-brown, white rump, red-brown underparts with heavy spots, and bars (east and west coast birds have heavier barred and spotted, paler underparts and often show white bellies). Strong direct flight. Short-billed Dowitcher: Breeds in southern Alaska, central interior Canada, and northern Quebec. Spends winters along coasts of California and Virginia southward. Preferred habitats include mudflats, creeks, salt marshes, and tidal estuaries. The name of this bird can be somewhat misleading, as its bill is only short in comparison with the Long-billed Dowitcher. The nest and eggs of this species eluded discovery until 1906, and even that information was overlooked for a long while because they were attributed to the Long-billed Dowitcher. 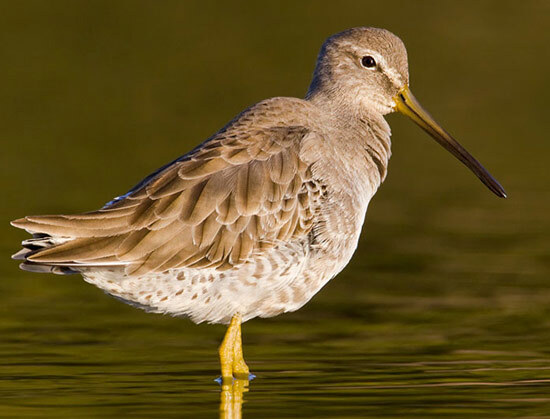 The Short-billed Dowitcher has a large range, estimated globally at 1,400,000 square kilometers. Native to the Americas and nearby island nations, this bird prefers grassland, wetland, and marine ecosystems. The global population of this bird is estimated at 320,000 individuals and does not show signs of decline that would necessitate inclusion on the IUCN Red List. For this reason, the current evaluation status of the Short-billed Dowitcher is Least Concern.